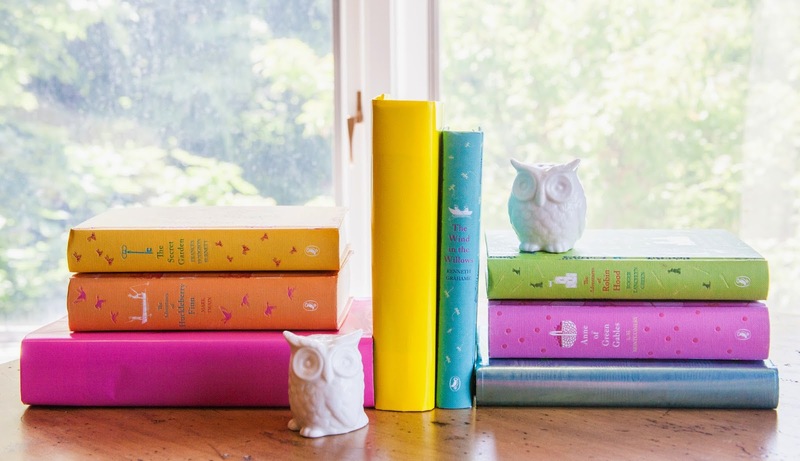 Last month I shared some ideas with you for different color concepts for styling your bookcases. This month I would like to share a DIY on how to accomplish these looks, even if you don't have the books to achieve the color combinations you are looking for. 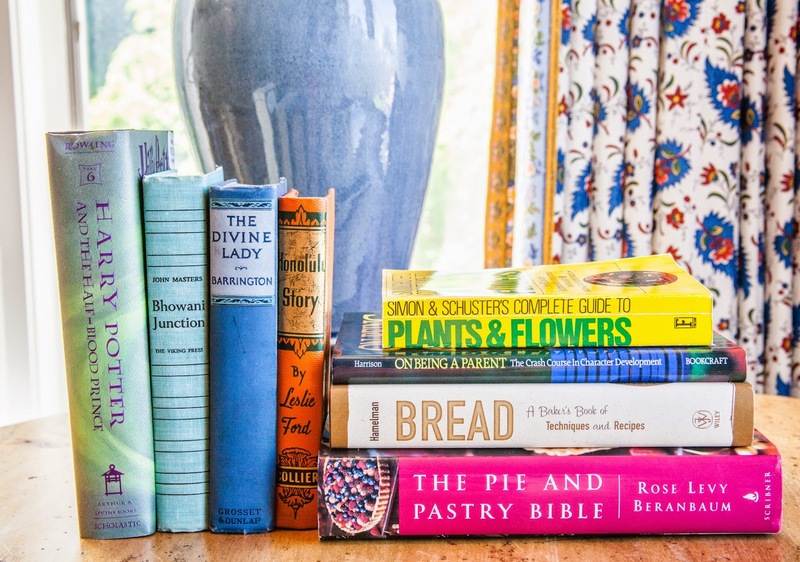 We all have books in our home that we don't necessarily think to use when we are attempting to design a decorative bookcase such as, cookbooks, text books, parenting books, gardening books, etc. Or we have an eclectic collection of books, that don't necessarily create a uniform or organized look. 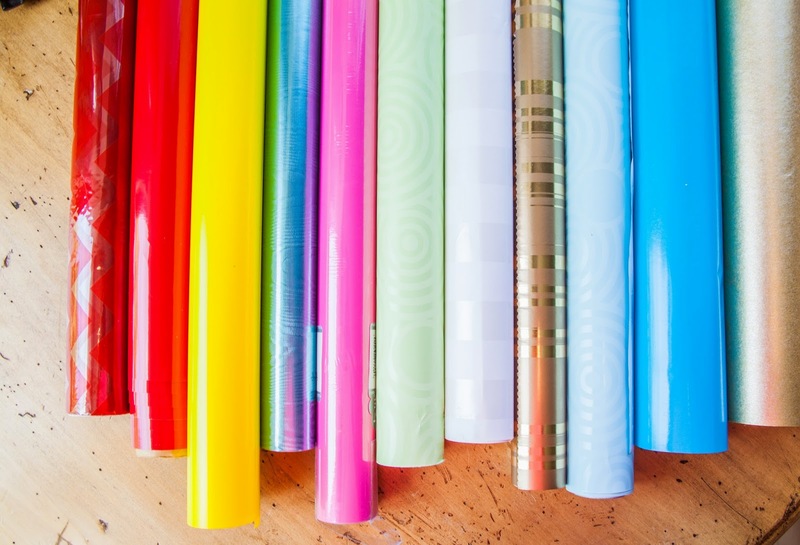 Wrapping paper is cheap and comes in any color you could possibly dream of, thus making it the perfect tool for creating any desired look for your home. 1.) Monochromatic patterns work the best. 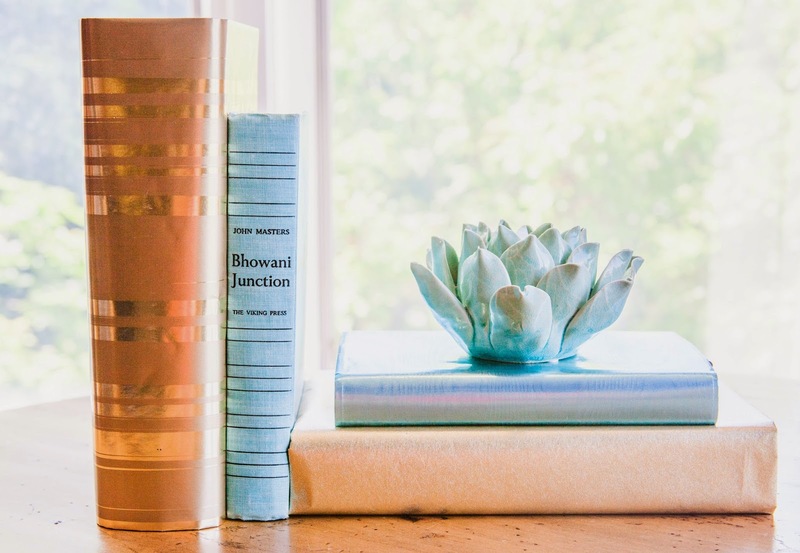 Having a slight, subtle pattern creates dimension and visual interest to your books. Having bold patterns can be tricky, if you have too many it can be too much. If you are drawn to bold patterns, I would suggested picking one or two for statement pieces and mixing them with more subtle patterns. 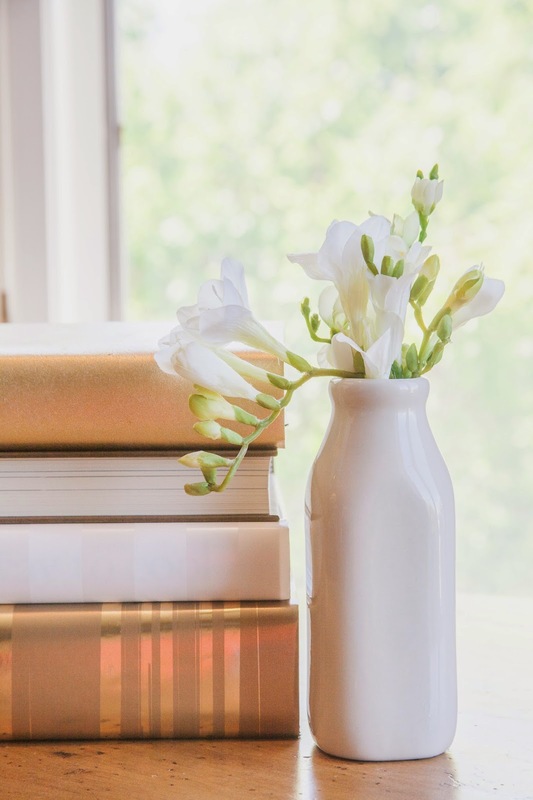 Plain colored wrapping paper can sometimes come across as flat and can make your bookcases look like they lack personality. It can be fun to mix patterned and plain colored papers to achieve unique color combinations. 2.) Pay attention to the thickness of the paper. I found that some wrapping papers are too thin for this project. If the paper is too thin, all the graphics on the spine and cover show through and clash with the pattern and it can be distracting. First, measure out how much paper you will need. 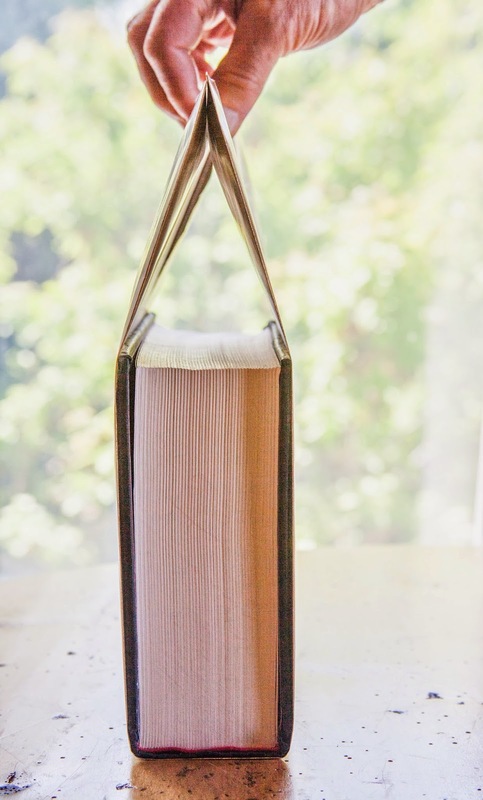 I found the easiest and best way to do this without getting all technical, is to place your book about 5 to 6 inches away from the edge of the paper, roll your book onto it's spine then on to it's back and cut the paper leaving 5 to 6 inches on the other side. Cut the paper again so there are about three inches of paper above and below the cover. 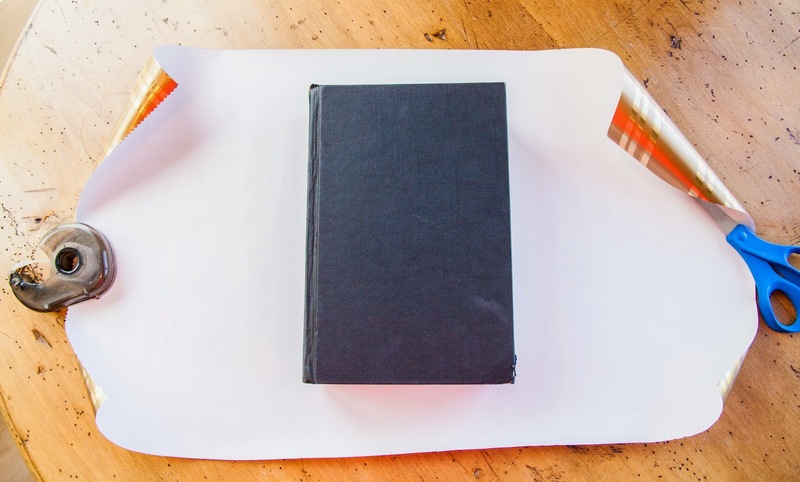 Next, fold the top and bottom of the paper so it lines up with the edges of the cover. This creates a durable edge, that won't rip or wrinkle easily. 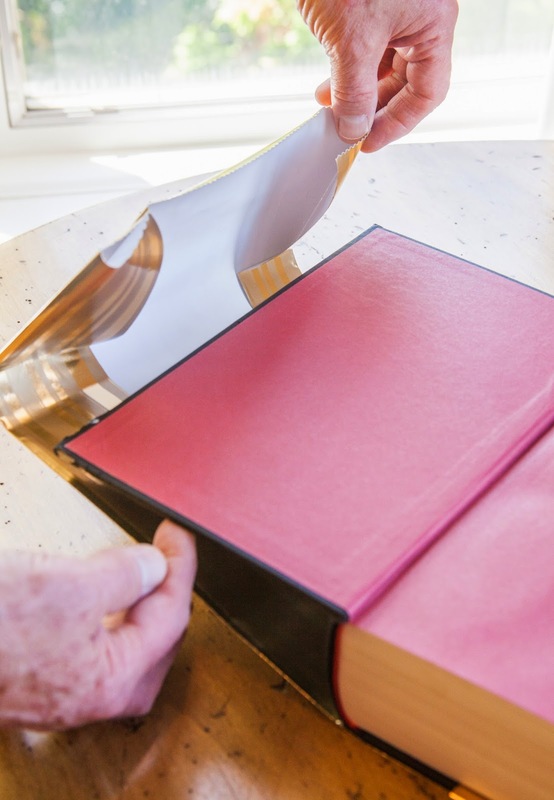 Next, find the middle of the paper so that it will wrap tightly around the spine of the book. And you are done! This entire process takes only a couple of minutes, and the result is so rewarding. You can also design pretty ways to write the title of the book on the new colorful jacket, making it easy to identify which books you have wrapped. 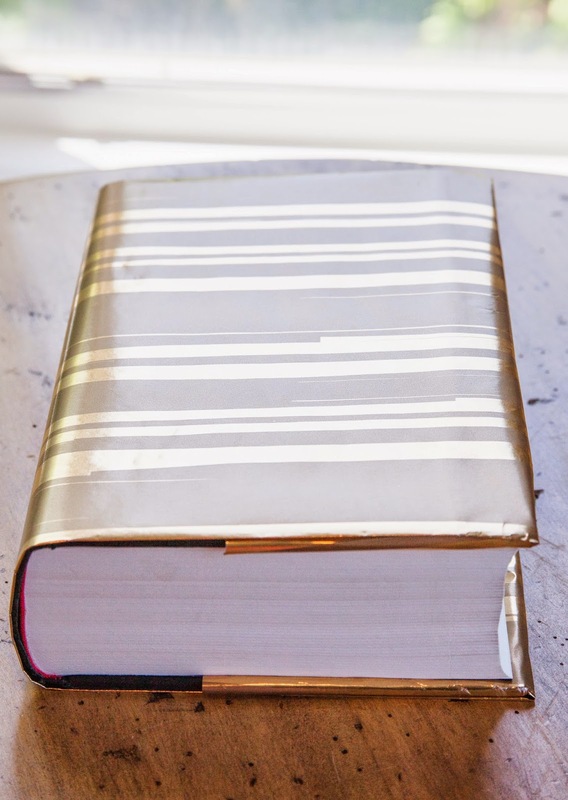 If you were drawn to the Clean and Classic Neutral look from my last post, you can mix in some books wrapped in gold wrapping paper to really add some class and interest to your shelves. 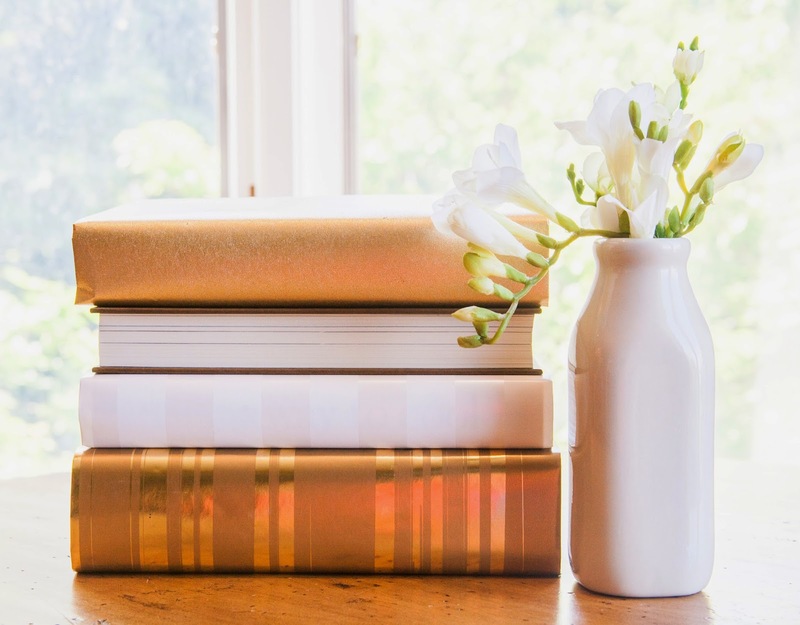 This is also a great alternative to get the neutral look without having to turn all your books around, which can sometimes make it difficult to find a specific title. If you are looking for something similar to the Pop of Color example from last month, I created this look that I thought would be fun in a child's bedroom or play room. I mixed my wrapped books with some fun colorful books that I already had, but it would be easy to create this look entirely with wrapped books using random books from around your home or books that you find at the DI or thrift stores. My last example mixes neutrals and color to create a look that would be calming and peaceful for your living space. 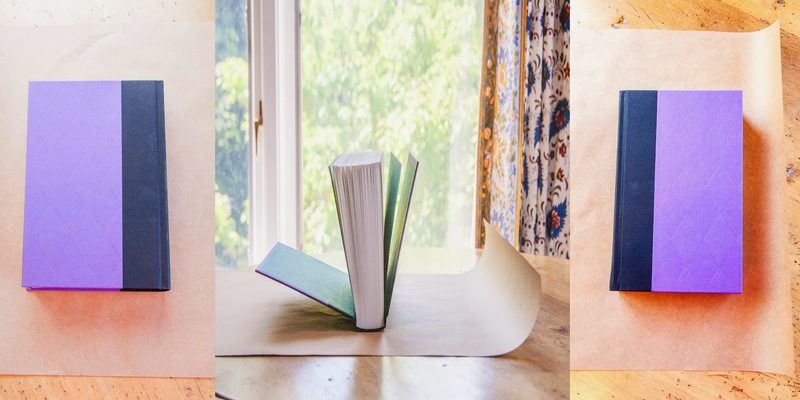 I would love to see what color combinations you create with your newly wrapped books. Post your pictures to instagram and make sure to tag @deliciousreads in your caption so I can see your beautiful creations! 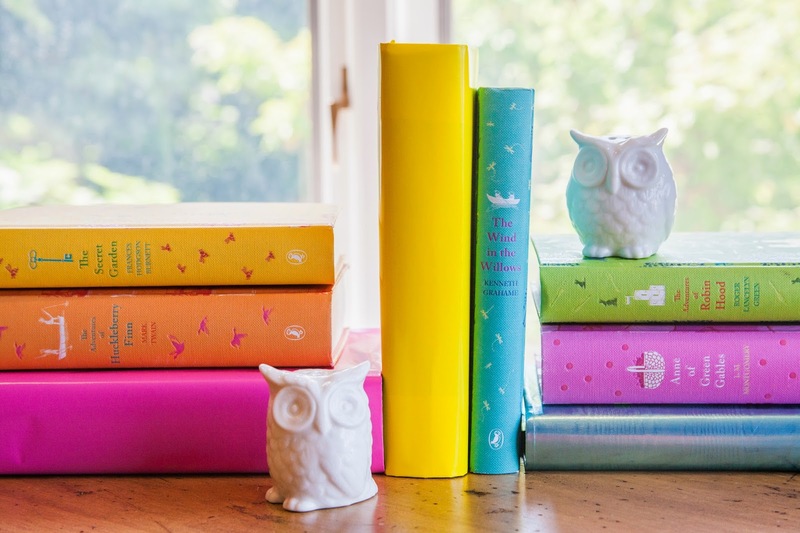 Beautiful books Kitch! 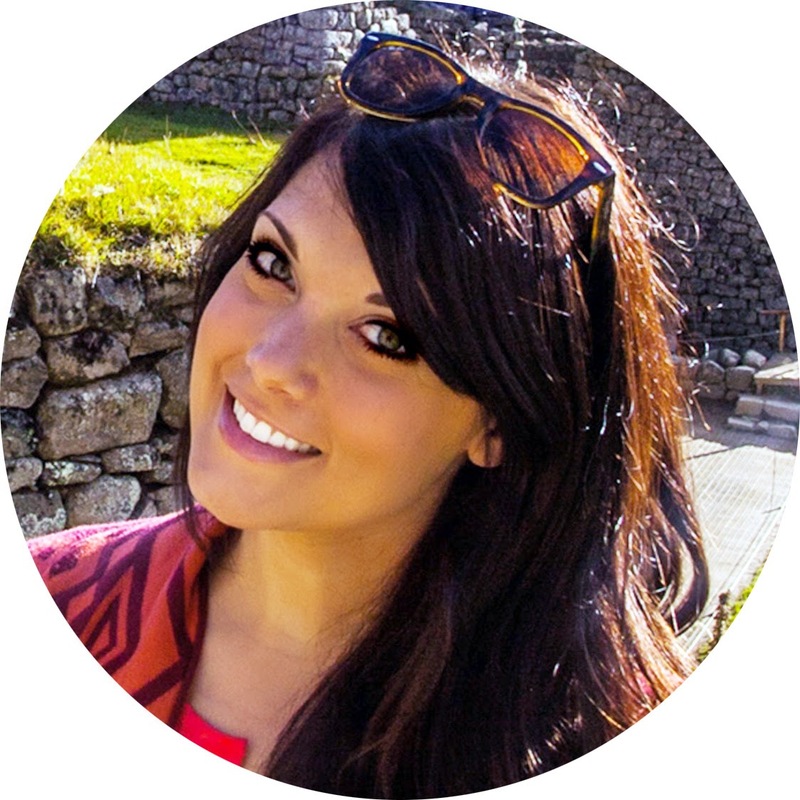 You have such a lovely home and so many creative ideas. Do you ever label the bindings or do you just remember the books? Yes! I totally do. 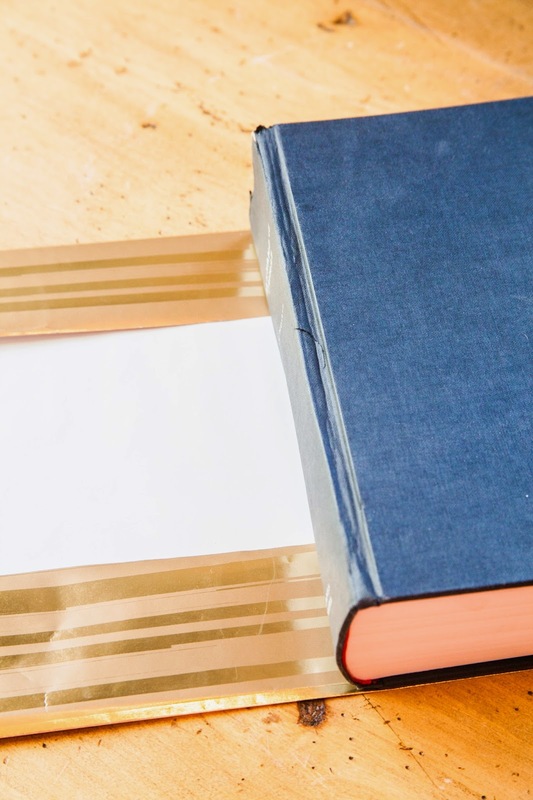 That is another reason why this method is so great, you can label your books anyway you want! I am no the greatest at pretty calligraphy so I didn't do any examples of labeling, but it is a great way to remember which books you have wrapped! 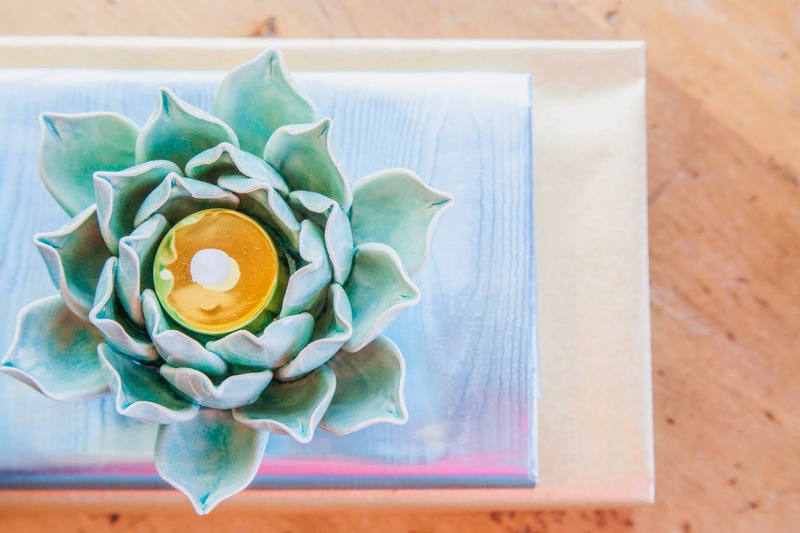 Great directions and how to...can't wait to try it to co-ordinate with a table centerpiece.